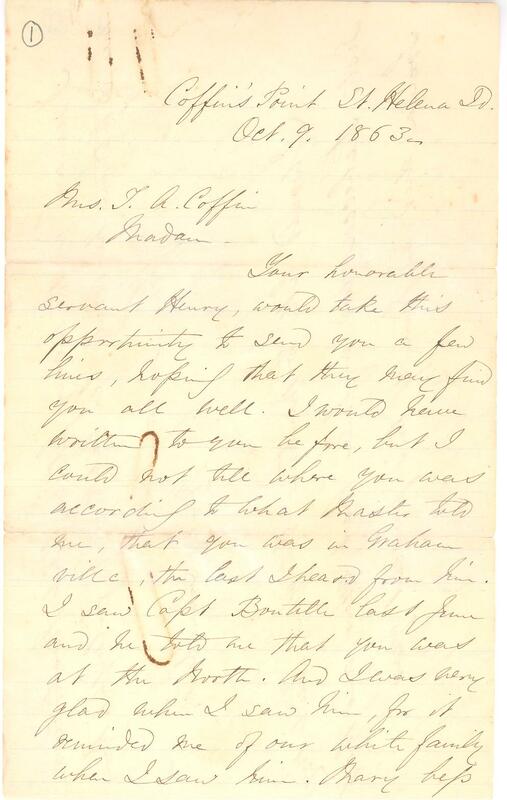 Item Description: Letter dated 9 October 1863, from Henry Lowndes, formerly enslaved by the Coffin family, to Mrs. T. A. Coffin. 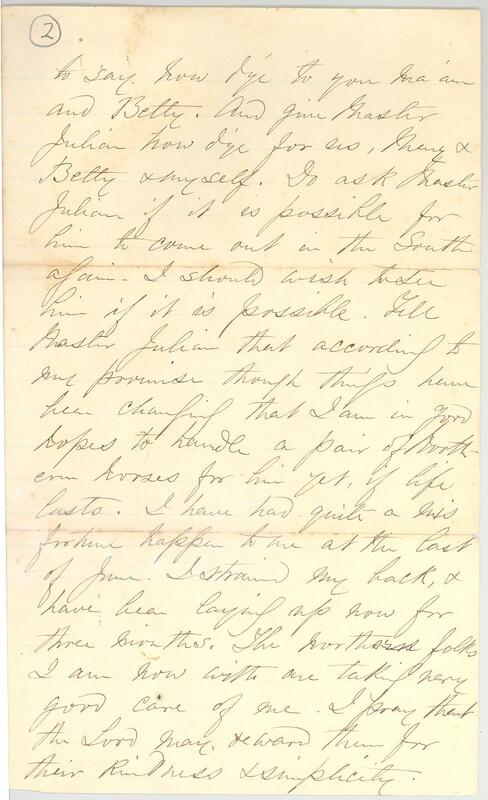 In this letter, Henry provides an update for Mrs. T. A. Coffin by providing information about injuries he has incurred, being cared for by Northerners, as well as the death of his sister, Rebecca. Henry also states that he remains at Coffin’s Point, awaiting the return of “Master Julian”. 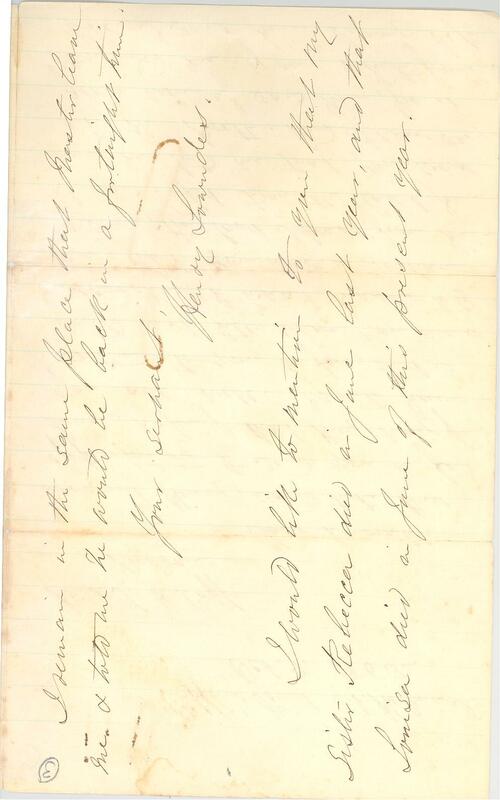 Item Citation: Letter dated 9 October 1863 in folder 1-A, in the Penn School Papers #3615, Southern Historical Collection, Wilson Library, University of North Carolina at Chapel Hill. Coffin’s Point St. Helena Id. Your honorable servant Henry, would take this opportunity to send you a few lines, hoping that they may find you all well. I would have written to you before, but I could not tell where you was according to what Master told me, that you was in Grahamville, the last I heard from him. I saw Capt. Boutille last June and he told me that you was at the North. And I was very glad when I saw him, for it reminded me of our white family when I saw him. Mary begs to say how d’ye to you ma’am and Betty. And give Master Julian a how d’ye for us, Mary, Betty, and myself. Do ask Master Julian if it is possible for him to come out in the South again. I should wish to see him if it is possible. Tell Master Julian that according to my promise though things have been changing that I am in good hopes to handle a pair of Northern horses for him yet, if life lasts. I have had quite a misfortune happen to me at the last of June. I strained my back, + have been laying up now for three months. The Northern folks I am now with are taking very good care of me. I pray that the Lord may reward them for their kindness + simplicity. I remain in the same place that Master leave me + told me he would be back in a forthright time. I would like to mention to you that my sister Rebecca died in June last year, and that Louisa died in June of this present year.